How the hell did X2 think they could name their tablet PC the "iTablet," and get away with it? Sure, Apple may not be using the name, but did X2 think we weren't paying attention to all those rumors? 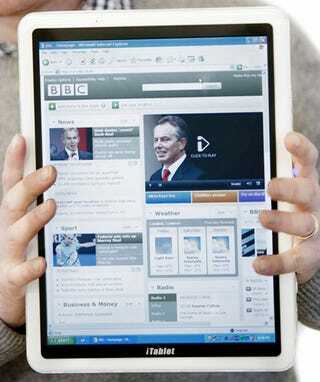 Nonetheless, the iTablet—which hails from the UK—actually sounds very decent. For a tablet taking on the iPad, anyway. It runs Windows 7 (alright, naysayers, keep it down in the back), and is powered by a 1.6GHz Intel processor. It's available in two sizes, of 10.2 and 12.1-inches (both 35mm thick, which sounds horrendously thick, given the iPad is 13.4mm deep), and each model contains 250GB of internal storage, a 3G chip and Bluetooth.